With the 2013 TT ZERO due to start in about an hour, the Clerk of the Course has posted the official starting list for the race. 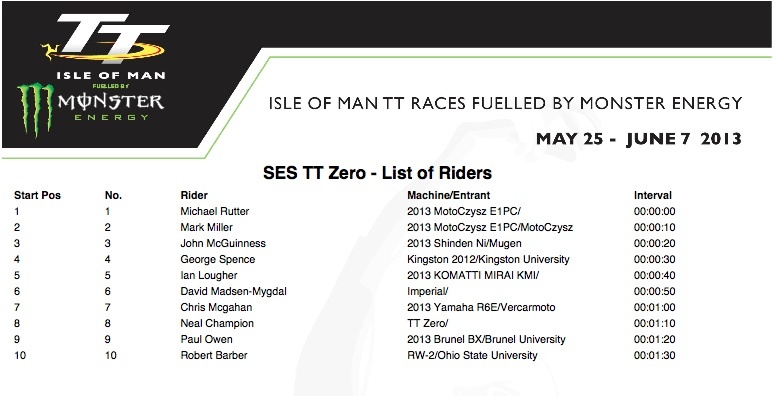 The starting list is somewhat based on the fastest lap times achieved by each rider over the three qualifying rounds. Though, looking carefully, I'm surprised that John McGuiness is starting at #3 when he's done so well in qualifying including the 109 miles/hr lap time on Monday. And has Rob Barber done so badly to be the last to start? From those results we see McGuiness placed first in qualifying on Friday and Monday, placed a very close second in qualifying on Saturday, yet is still starting in 3rd place. Scratch head, wonder why. Of course it really doesn't make any difference because this is a time trial race. Theoretically, the guys are racing against the clock primarily and are being started at 10 sec intervals so that each has their own ride.